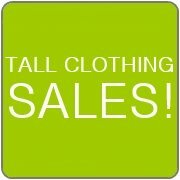 Like many of you tall ladies out there, I have a hard time finding outerwear that fits. The sleeves need to be long enough so that my wrists aren't cold. And, the torso length needs to drop past my waist. Recently, my go-to winter coat got a rip in it (boo! ), so I hopped online and did a little shopping. I decided to try out a couple of styles from Eddie Bauer's tall collection. Of course, I still have my rain jacket that I purchased from Eddie Bauer last year, but even in Texas it gets cold during the winter and I need something to keep me warm. 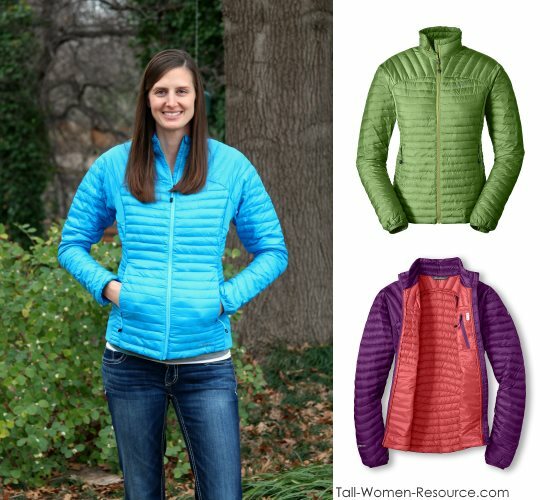 I chose the MicroTherm® StormDown® Jacket and the Essential Down Parka to try out. It just so happened that these were on sale at the time (score!) and I got free shipping (score again!). Here are my reviews on these two styles. For reference, I'm 6'1" and bought a size Tall Medium. This is one of those kinds of jackets that are super light and, upon first look, make you think that there is no way it will keep you warm when it's cold outside. But, looks can be deceiving! It's warm! Inside the jacket is a special kind of super high-loft down that, according to Eddie Bauer, will keep you warm in temperatures as low as 45 degrees when performing low-level activities and as low as -5 degrees with moderate activity. I was outside in 40 degree weather on this particular day and I wasn't cold. As for the tall fit, I give it a 7 out of 10. The sleeve and torso length are just right. The only issue for me is the hole opening at the arm pit. I feel like for my longer upper body, it could be a bit more open in that area. Over a somewhat bulky sweater, this jacket is a bit uncomfortable in the armpits (for me anyway). Over light layers, it's much better. 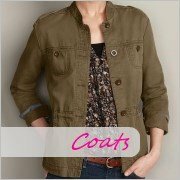 This jacket comes in a number of striking colors, has several zip pockets, repels water, and can scrunch up to be easily packed in a bag. All great things. Honestly, I've never owned a parka or other long-length coat. In Texas, our super cold days are pretty limited in a typical winter so I just never wanted to take the time to search for one that would fit. I decided to go ahead and give this one a try...and I'm glad I did! Right when I put it on, I was impressed by its warmth. Like the jacket reviewed above, this one is filled with a premium down. It is also stuffed with a ThermaFill® insulation which gives it extra warming power. 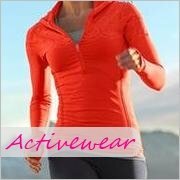 In the description, Eddie Bauer says it will keep you warm in temperatures as low as 35 degrees during low-level activities and -25 degrees with moderate activities. That's a coat that does its job right! I really like the fleece cuffs that are hidden underneath the sleeves at the wrists. I also really like the quilted pattern that would flatter many body shapes. As for the tall sizing, it's pretty accurate in my opinion. The fit is not quite as snug as the jacket above and allows for a little more room to wear over thicker tops. This coat comes in several different colors. It has three zip pockets as well as a front zipper that is two-way so you can be more comfortable when sitting and moving. 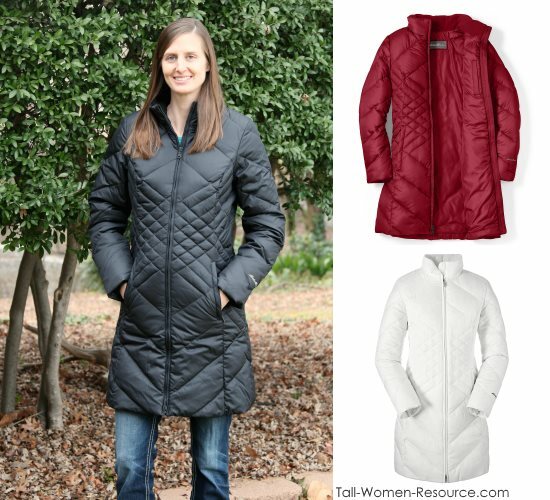 This is great long-length coat that would be a good purchase for many tall women! Please note: I bought these coats myself and the opinions in this review are my own.